Oh wait - no it isn't. There are endless bumper stickers, T-shirts, and websites promoting the idea that "concrete is forever". This is very easy to refute, from a trade magazine for parking lot engineering to, well, the picture to the left. The RV park at Priest Rapids was abandoned at some point since the dam was completed in 1959. 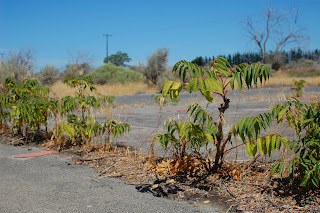 It didn't take long to become overrun with sumac, and will soon be unrecognizable from other idle land in the area.